The Alabama Crimson Tide won the 2009 BCS National Championship with a victory over the Texas Longhorns in Rose Bowl Stadium. Although the contest was held in the venue, it was not the Rose Bowl Game for that season. To honor the historic connections of the Alabama football program and Pasadena's iconic landmark, a fan poster was created by the University of Alabama featuring the school's fight song "Yea Alabama." 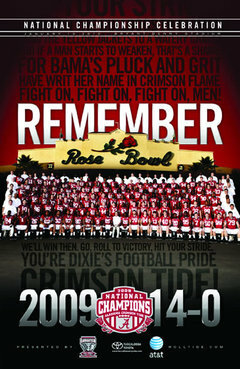 The posters were handed out to fans at the official celebration for the 2009 National Champions held at Bryant-Denny Stadium on Jan. 16, 2010 and later offered for sale through the school's athletic department.